Answering the demand for acomprehensive, all-purpose volume focusing on the challenging needs of pediatric patients, Mechanical Support for Cardiac and Respiratory Failure in Pediatric Patients summarizes a wealth of knowledge on the mechanical devices, clinical management, alternative applications, and future directions in the specialized field of pediatric critical care. Condensed advice from experts on the shelf offers guidance in critical intensive care settings! Authored by nearly 40 internationally recognized experts and containing over 500 literature references, drawings, photographs, and tables, Mechanical Support for Cardiac and Respiratory Failure in Pediatric Patients is an invaluable reference for cardiologists and pediatric cardiologists, intensivists, cardiac surgeons, pulmonologists, anesthesiologists, general pediatricians, nursing personnel, perfusionists, and medical school students in these disciplines. This remarkable book…beautifully assembled and edited by Brian Duncan pleads the case for the importance of cardiac assist devices for the neonate, infant, and child….The differences are in fact legion and are beautifully presented in this book. Dr. Duncan has brought together many of the leading figures in the field. "…a comprehensive book that assembles a good deal of knowledge on cardiac assist devices…. …an excellent reference for practical aspects and current knowledge related to circulatory support in children. 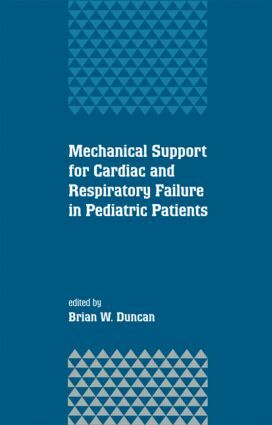 …a single source of information on the state-of-the-art of mechanical circulatory support in the pediatric population.